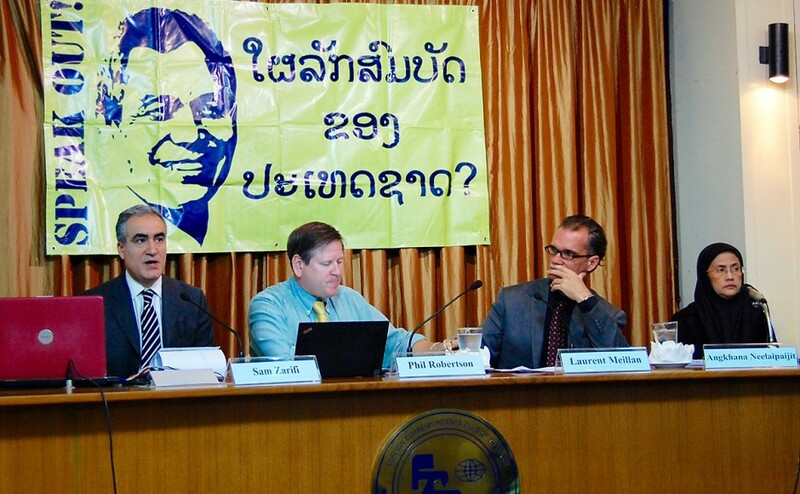 Human rights representatives speak at the Foreign Correspondents Club of Thailand (FCCT) in Bangkok, Monday. Sombath was abducted in Vientiane Laos on the evening of December 15, 2012, at a police check-point where he was then transferred to another vehicle according to police surveillance video. At the press conference in Bangkok newly made public CCTV footage, found by Sombath’s family, showed the car further south on the road as the car traveled back into the capital. Communist Laos has shown “no political will to solve” the mystery of the abduction of a prominent social activist, a United Nations human rights official said on Monday, on the third anniversary of the kidnapping. The United Nations and the International Commission of Jurists (ICJ) said police in Laos refused to view new footage of the abduction of Sombath Somphone, a civil society leader who worked to promote sustainable development for the rural poor. Laurent Meillan of the UN Office of the High Commissioner for Human Rights said the abduction had created “a culture of fear” among workers of non-government organizations in Laos, one of Southeast Asia’s poorest countries. In January, Laos was assessed on its rights record and accepted some recommendations made by the U.N. Human Rights Council, including a call for a transparent investigation into the disappearance of the internationally acclaimed activist. "Enforced disappearances in the Lao PDR alarming"
Laos is a signatory to the main international human rights instruments1 including the Convention for the Protection of All Persons from Enforced Disappearance (ICPED); yet, the practice of enforced disappearances in the Lao PDR is alarming. …However, Laos has failed to prove that an impartial investigation had been conducted in regards with Mr. Somphone’s abduction. Only vague official statements have been formulated so far… This on-going situation demonstrates the Government of Laos’ lack of willingness to cooperate with the WGEID. From a General Allegation made by the Asian Federation against Enforced Disappearance to the UN Working Group on Enforced and Involuntary Disappearances. To mark two years since the enforced disappearance of Sombath Somphone, a press conference was held at the Foreign Correspondents Club in Thailand on December 11th. Two years after the abduction of the prominent, internationally acclaimed Lao development worker Sombath Somphone by Lao state agents, the Lao government has done very little to find the truth, experts say. Meanwhile, the disappearance and lack of justice has effectively created a climate of fear which has worsened the human rights situation in Laos. GENEVA (16 December 2013) – A group of United Nations human rights experts today urged the Government of the Lao People’s Democratic Republic (Lao PDR) to increase its efforts in the investigations into the enforced disappearance on 15 December 2012, of Sombath Somphone, a prominent human right activist working on issues of land confiscation and assisting victims in denouncing such practices. …of concern that six months on there seemed to be no progress in investigating the supposed forced disappearance of Sombath Somphone, a human rights activist from the Laos People’s Democratic Republic. He disappeared as he was driving home from the capital of Vientiane on 15 December 2012. Security camera footage supposedly showed his car being stopped by police and then him being driven away by men in plain clothes. The OHCHR was concerned about his safety, as his whereabouts were unknown and no progress has been seen in identifying the suspected perpetrators. OHCHR urged the Government to intensify measures to locate him and to ensure his prompt, safe return to his family. 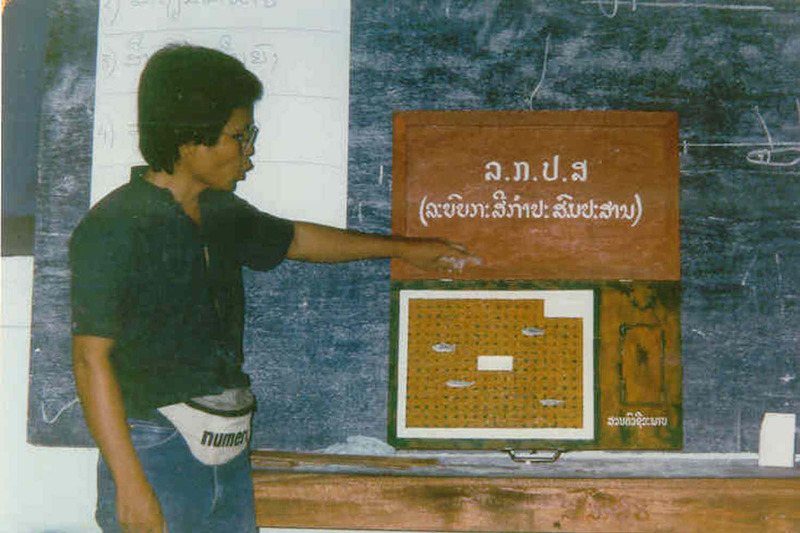 Sombath Somphone had been recognised worldwide for his work on equitable and sustainable development. Reports suggest that his apparent abduction may be related to this.